Jeff Bezos is now the richest man in the world. He’s achieved this vaunted status is because of the price of the stock and the corresponding value investors are assigning to the company he founded, Amazon, in the public markets, not because of Amazon’s profitability, or the income being generated by the company, is flowing directly in Bezos’ pockets. A company’s market capitalization, also sometimes referred to as “market cap”, is simply the number of shares outstanding, or the shares that are eligible to be traded in the market, multiplied by the price of the stock. For example, in Amazon’s case, the company has 492 million shares outstanding that trade and a stock price of $1100. When you multiply those two figures together you get a market value of around $540 billion. Because the prices of stocks change each day, the market caps of companies also change daily. There is a consistent jockeying taking place in the market as shares move up and down, and as the value of companies change based on business outlooks, profit and growth potential, and other factors that influence the supply and demand equation that impacts stock prices. Looking at the largest companies in the market today based on market cap clearly shows a bias toward large technology companies. 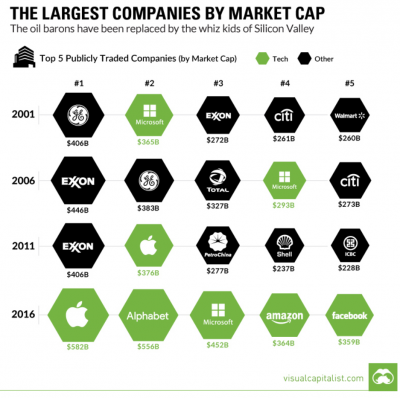 Of the top 10 largest firms, Apple, Alphabet (i.e. Google), Microsoft, Facebook and Amazon are included on the list. Of course, it wasn’t always this way and it won’t always be this way. 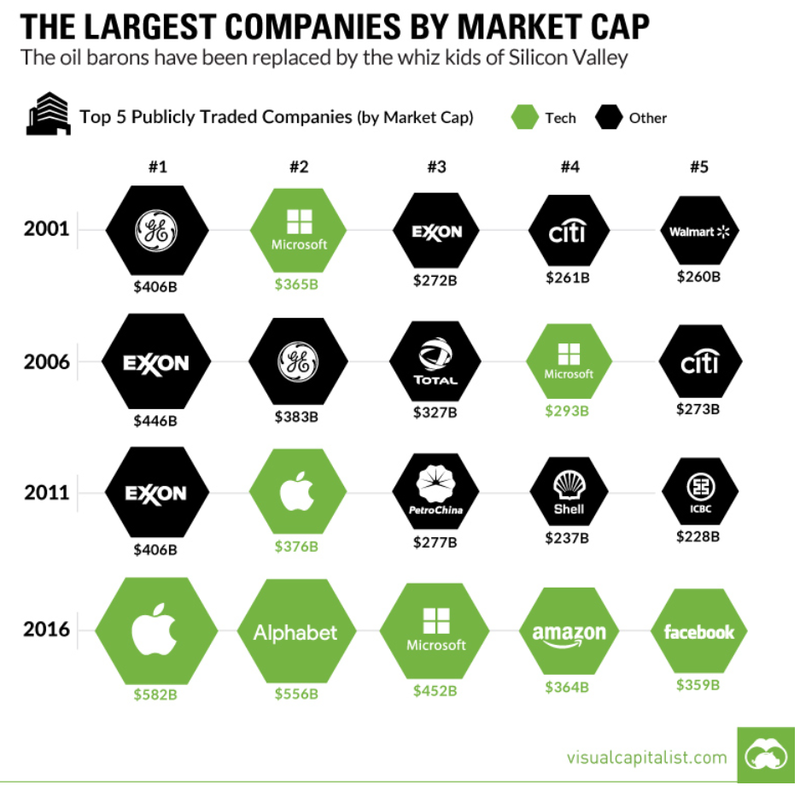 There is a great chart over at the Visualcapitalist.com that shows just how much the most valued companies have changed over the past 15 years from 2001-2016. Energy and behemoths like Walmart and GE have been dethroned by tech firms that in some cases aren’t even 20 years old (Facebook was founded in 2004). Market caps also are important in the money management realm as well. For starters, most major indexes — popular benchmarks like the S&P 500 — are market cap weighted. This means that the larger the company in terms of market cap, the higher the weight the company will have in the underlying index. Sticking with the Amazon example, at the current time, according to SlickCharts.com, Amazon makes up about 1.98% of the S&P 500 index. Major research companies like Morningstar and asset managers like Vanguard have different ways to determine what the breakpoints are for various size companies. 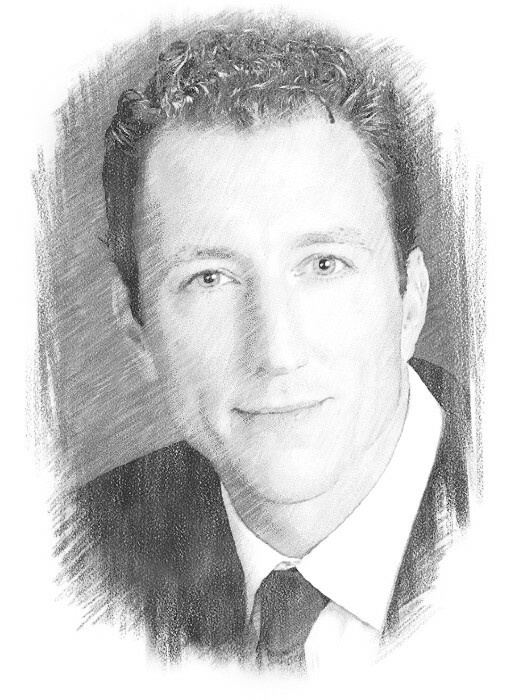 On Morningstar, for instance, when you look at a mutual fund or ETF, you will see they group the underlying holdings of the stocks in a portfolio in one of five “size” boxes, which are determined by market caps. On Vanguard, you can look at an ETF or mutual fund to determine the breakdown in terms of holdings and size characteristics. In the table below, which uses the Vanguard thresholds, you will see the five size categories include: Large, Medium/Large, Medium, Medium/Small and Small. Morningstar categorizes stocks a bit differently. When looking at the universe of stocks investors have to choose from, a very large portion of stocks that trade are in the micro and nano cap areas of the market. According to the Wilshire Associates website via this post on Pocketsense, of the names in the Wilshire 5000 index, approximately 750 names are large and mega caps and 1750 names are small and mid-caps. The remainder of the stocks, so the other 50% of the index, are in micro and ultra-small caps. These companies are very difficult to invest in for money managers due to their small size and lack of liquidity. Market caps in and of themselves generally aren’t used as a sole investment criteria when selecting stocks, but they can be coupled with other factors to identify investment opportunities. I’ve highlighted a few examples below from our quantitative models, which are built using the disclosed strategies of famous investors. The Contrarian model we based on David Dreman’s work requires that a company be in the largest 1500 stocks by market cap because Dreman believes these firms were less susceptible to accounting tricks and irregularities. The two models we follow based on James O’Shaughnessy, author of What Works of Wall Street, use market cap as a flooror cap. His O’Shaughnessy Cornerstone Growth model, requires a market cap of at least $150M, while the Cornerstone Value model, which seeks out value stocks, requires a market cap of at least $1 billion. Our Warren Buffett-based model, which uses a series of criteria to identify high quality companies, tends to focus mostly on mid to large caps that have a long term (i.e. 10 year) record of consistent earnings and higher than average returns on capital and equity. Taking this a step further, as an example, we can use the screening tool on the Validea web site to find stocks that pass at least three of our models with an 80% score or higher and that have a market cap of between $3 billion to $8 billion, which is the Small/Mid Category band determined by Vanguard. While investors shouldn’t choose to invest in stocks based solely on a rising or falling market capitalization, the market cap can be used in tandem with other criteria, and that is how it is used by many of the gurus we follow. Additionally, the market cap can give you concrete data point to see how the market values a firm both in the current market and historically.